For the past few weeks, Eric & I have been working on repairs & updates to my rental property, since it’s between tenants now. Here I wanted to share one of the major transformations, and how some sweat-equity can save lots of money. The Front Door Facelift! This was really Eric’s project while I worked on some things inside (and ran outside every 30 minutes to snap a picture). A real labor of love. I was considering buying a new front door. Minimum $169 for a basic steel door. I really like the wood look fiberglass doors, those are minimum $450. I was trying to keep my costs down on the house, I was doing some other big projects so the front door is one area I was able to save some money (although it probably took more labor-hours to complete). Here is a very early “before” picture. Before I touched it at all. 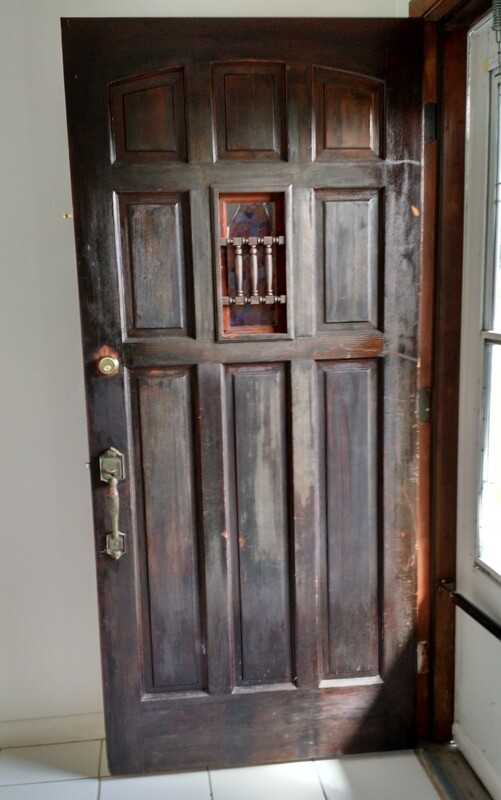 Really terrible, which is a shame because it’s a beautiful solid wood door. It looks like it went through painting and gel stain but the stain didn’t get the wipe-off portion. Also, you can’t really tell, but it was very splintery. I got lots of splinters when I started sanding. 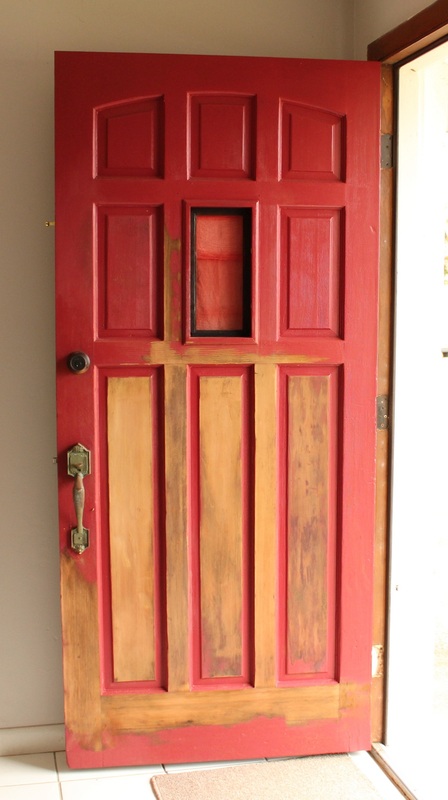 Last year, I painted the door Red after doing some sanding. It still had a bad texture in it, but I couldn’t get it all out, or at least didn’t want to spend the time doing all that work. Looking back, I don’t know what I was thinking going with that red. A Close-up of a panel. 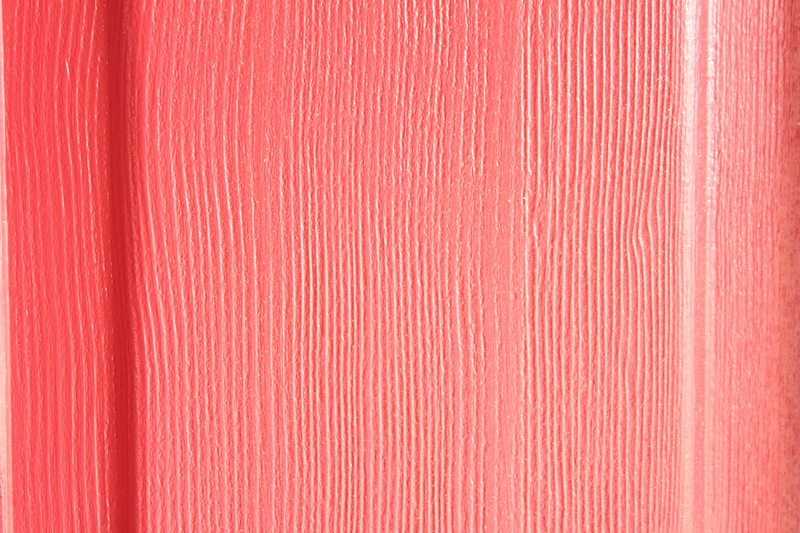 You can see a bit of texture here. Eric speculates that the door was pressure washed in the past, and it shouldn’t have been. It probably ate away at the soft parts of the wood (leaving the deep grooves). Starting to sand the door! The door had this ugly mini-door. It was too difficult to sand the door on the hinges, so Eric propped it up on sawhorses and went to town with the belt sander, the corner cat sander, and a flapwheel sander (to get the panel grooves). So Eric took out the ugly rails in the mini-door and the frame that held the glass in place.The brown frame you see in the picture above was the frame around the glass. I picked up some decorative trim from Home Depot and Eric nailed the outer frame in place and filled in the nail holes with wood filler. Went to Ace Hardware and ordered a piece of glass to fit. We measured the exact opening and asked for a piece that was 1/4″ off each dimension. (The trim was 7/16″ thick so we had some wiggle room there). So I’ve got to give credit to Lowes (HERE is the link to their how-to project page) for this idea because I never would have thought about it. I was thinking about buying some vinyl-stick on that cost about $19 to add privacy to the glass. But instead, we found Frosted Glass Spray Paint (THIS stuff!) for less than $5. We taped off the edges with Frog Tape and spray painted the exposed glass. I thought it added a nice touch. I would have painted the whole thing but I was surprised at how well it came out. Hopefully it holds up for the long term. Here’s a closeup of the inside. I missed a few pictures in between here. But Eric inserted the glass and then nailed in place the inner trim pieces to sandwich the glass. I had some stain on hand called “Carrington” by Varathane and I was surprised at how well it matched! I bought a sample paint from Home Depot called “Millenium Silver” (Behr). It was enough to cover the door with two coats for about $3.48! Here’s a closeup of the glass from the outside. Obviously, the trim I bought wasn’t a perfect match to the existing trim. Close enough.